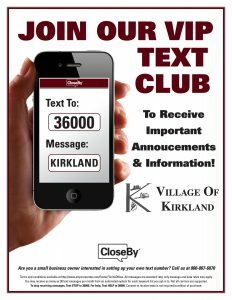 We’re excited to announce we have a NEW Text Program for the Village of Kirkland! We will send out text alerts with important Village announcements and reminders! Signing up is simple… text KIRKLAND to 36000 and you will be enrolled!! We hope that this new service increases communication of events, alerts, etc. within the Village of Kirkland! Thanks! !